In anticipation of Poetry Friday tomorrow, this post celebrates not only poetry but some good, new nonfiction. 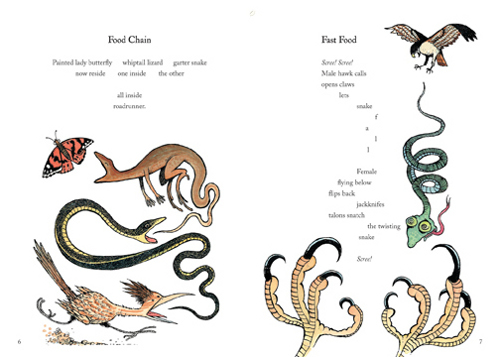 The poem featured above, “Food Chain,” comes from the above spread (left-side illustration) and is one of the many poems in What’s for Dinner? 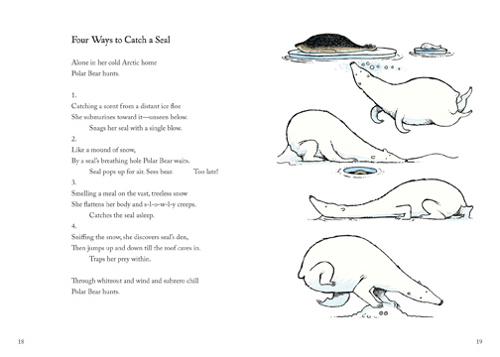 : Quirky, Squirmy Poems from the Animal World (Charlesbridge, February 2011), written by Katherine B. Hauth and illustrated by David Clark. As I scan reviews for this post, seeing as how I’m a review nerd, I see that Publishers Weekly calls this one a “satisfying mix of tutelage and repartee.” But my favorite of all? Kirkus writes that this is “an enriching overview of the natural world spiced with a Dorothy Parker–esque sense of the macabre that children will absolutely relish.” And, as you can see by the cover alone (below), Clark’s ink and watercolor illustrations are, indeed, macabre, over-the-top fun. Kirkus adds that the “conclusion of this volume’s title poem—’finding food / is not a joke. / Living things must eat / or croak’—with its blunt appraisal of the whey of the world per se, sets the tone of Hauth and Clark’s graphic exploration of who eats what.” This post is good timing, given that just the other day author and illustrator Paul Schmid stopped by 7-Imp and discussed, amongst other things, how—as he put it—children are so eager to explore the wholeness of life, including play-acting death and savagery, noting that his own child, when younger, often played predator/prey, pretending to be a creature dining off one of her stuffed animals. Yup, children—as Adrienne Furness and I have discussed before in one of my favorite 7-Imp posts from years ago—are quite taken by the good, ‘ol-fashioned food chain. The book also closes with “More Words About the Animals,” Hauth giving children even more information about the ways of the food chain. The wonderful Carol Rasco from RIF will host tomorrow’s Poetry Friday right at this link. WHAT’S FOR DINNER? : QUIRKY, SQUIRMY POEMS FROM THE ANIMAL WORLD. Copyright 2011 by Katherine B. Hauth. Illustration © 2011 by David Clark. Published by Charlesbridge, Watertown, MA. This is brilliant, fully realized book…I am so glad you spotlighted it. What a great book! My daughter is fascinated with animals and what they eat and what eats them! She will love this book. I love that it is told through clever poems. julie larios brought this book to my attention last week, and the thing about the book that catches me is how smart it is. 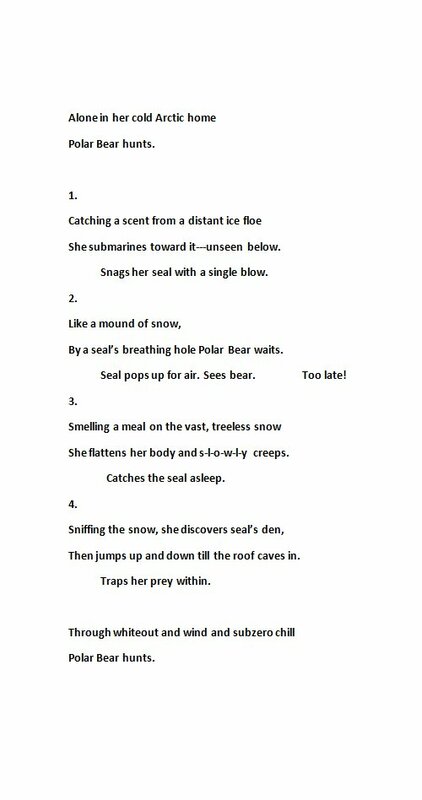 they aren’t just poems about the food chain, they’re clever. they have boy-appeal and reluctant reader-appeal and poet lover-appeal. a trifecta. thanks for sharing more of this excellent book. I will have to check this out! I’m glad you included some images of the art from the book — really gives you a feel for how it’s all laid out. I do appreciate the reality of it all… Even if I pretend that everything and everyone is vegetarian like me, I understand why the food chain works the way that it does! My kicks will have to come tomorrow afternoon. I have a super early call time for a TV pilot shoot tomorrow morning, followed immediately by our first rehearsal for a film! Little Willow, BREAK A LEG on that callback! I have fingers crossed for you. Plus: TV pilot! Film! Woot! Oh, man, that looks fantastic. I am ordering a copy for the library.